For the first time in 30 years, I hosted the Halloween festivities of trick or treat. These are the hard earned lessons. When you celebrate Halloween like a full contact sport, no detail goes overlooked. It is a show, and every nuance is taken into full account. A combination of terror, humor, and the fun of being part of a greater community. Our hosts have a Halloween reputation, they’re “that house.” The house every kid remembers, and no adult could ever forget. They take the holiday to the next level, and the parents love it as much as their kids. When you’re “that house,” there is always the expectation to take it up a notch each year, and our hosts did not disappoint. A dog skeleton in a closed cage. Their garage transformed into a theatrical chamber of horrors. Orange lights strung up and down their lawn. Premeditated spooking. An homage to Peanut’s “The Great Pumpkin,” and costumes that would pass the Michael Westmore test. When it comes to Halloween, they mean business; and every kid who approached got a fistful of candy, and an experience they will never forget. Ever so often there was someone who approached this amazing arrangement, determined to show they cannot be scared. You recognize them as soon as you see them. They strut with their shoulders back, head up, and occasionally announce, “I’m not scared of anything!” A tried and true tough guy act. This bravado tells you immediately that this one is in for a real scare. As they reach into the bowl of candy, their attitude instantly evaporates when a hand touches theirs from out of nowhere. No doubt the Guinness record for the backwards long jump was set by a trick-or-treater who got more than they bargained for. There is no easier way to hear a four letter word from a 9 year old than when they realize more than a Snickers bar awaits. Let’s be fair: there is a cut-off line in age when it comes to trick-or-treating. If you’re 13, it should really be your last hurrah. Once you’ve entered high school as a half-baked adult; you either feel too cool for it, or there is a costume party that brings new meaning to October 31st. However there are still those few mooching teenagers that try to capitalize, without even the consideration of wearing a costume. These yokels get the business. These characters often travel in packs of two or three, and their demeanor usually mocks the whole presentation. Of course they’re welcome to some candy, but they must earn it. When the host, dressed as an Orc, jumps out of the shrubs at them with a mock machete, these adventurists usually choose to leave empty handed. The shock of the experience leaves them momentarily paralyzed. As they take a moment to reorient themselves, seldom do they go any further. They try to regain their dignity, and usually shuffle away and pretend to dust the experience off their shoulders. Even the smallest kid usually understands Halloween is safe, good natured fun. Yet the fear they experience is genuine and transparent. Countless children in costumes hiding behind their parents, poking their head out of their foxhole to make sure they’re safe. Even the more daring youngsters cautiously accepted candy from our dynamic hosts. From a young age to our golden years, people love a good scare when they know there is no chance of actual danger. It is the roller coaster effect. Who doesn’t love the thrill and scare of an amazing experience, especially when they know they will walk away whole and well? Its the same reason there have been 10 movies in the Halloween franchise. The late George A. Romero understood this, and is a legend because of it. In truth, there is no other day of the year a parent could ever accept a stranger scaring the Beejezus out of their kids. Let alone a premeditated attempt. On the other 364 days of the year we call those people predators, but not on Halloween. The preparation, the company, and the enthusiasm gave me an entirely new appreciation for a holiday I hadn’t participated in for years. As a kid out trick-or-treating, I could never have understood how much my Dad must have enjoyed the experience as well. For all the challenges and rewards of parenthood, Halloween seems to be one of those days when a parent is able to share some of the best of their childhood with their own brood. While not discounting the amazing toleration required in bringing home a seven year old in possession of a treasure trove of sugar, it is all part of the greater experience. The TGNR Kitty immortalized in Jack-O’-Lantern form. 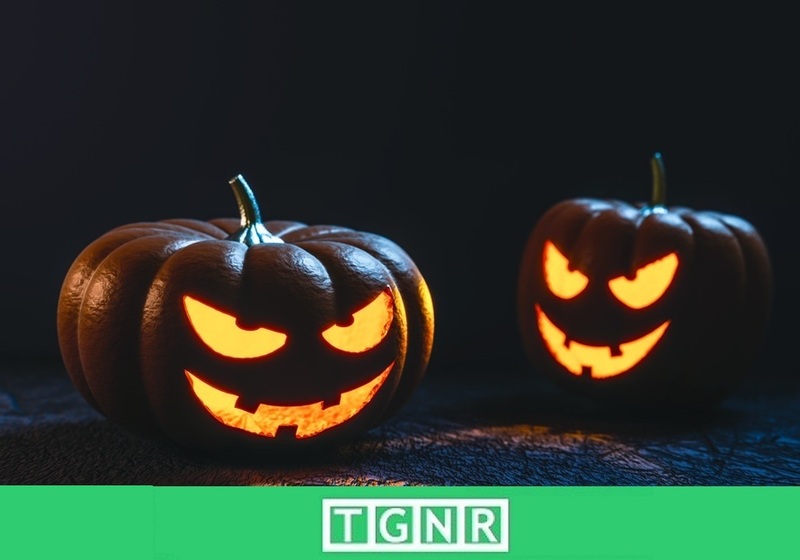 Halloween is singular in a way unlike most every other occasion in life: whether you’re five and out on the path for the first time, or a dignified member of society, it is a holiday where everyone can be a kid again. Youth is only wasted on the young if as an adult you cannot occasionally embrace the best yours had to offer. I thank our gracious hosts for making that night and this article possible. Join the conversation – follow TGNR on Social Media: Facebook, Twitter, Tumblr, Google+, Pintrest, Instagram, & Flipboard.